Tonight on Off the Hour from 5-6pm: #IdleNoMore continues to grow. This morning, after extensive pressure, Prime Minister Harper offered a January 11th meeting to the Assembly of First Nation (AFN) and Chief Theresa Spence. This came on the heels of AFN Chief Atleo offering a January 24th meeting with Harper and Chief Spence. At that point Chief Spence put a 72-hour deadline on the meeting. Tonight we speak with Plains Cree Metis woman Chelsea Vowel who holds a BEd, an LLB and teaches indigenous youth. She is also behind the apihtawikosisan blog and has been instrumental in #IdleNoMore. Metis artist, Moe Clark performs her original spoken word piece on #IdleNoMore. We speak with policy analyst for the Anishinabek Nation and writer, Jode Kechego. He joins us from London, ON to comment on Harper’s announcement. 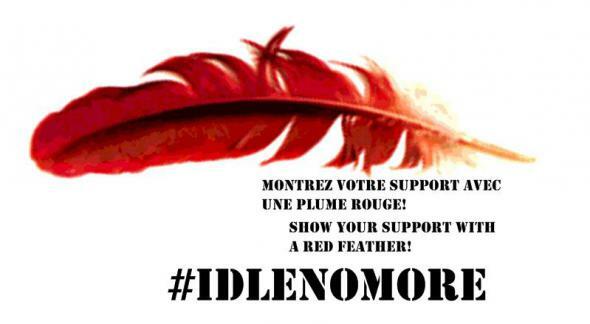 Montreal’s #IdleNoMore organizer, Melissa Mollen Dupuis gives us a local perspective. And more. Follow us on twitter @CKUTNews or find our updates here.